Seen in the Harvard Square subway station. It's the first of the month and so once again it is theme day for the City Daily Photo Blog community. Click here to view thumbnails of all other participating RED sites. Beautiful red and perfect delightful framing! Perfect for the theme. And I assume that you were able to get the photo withuot her noticing, otherwise you might have been smacked with the purse, and it looks like it could be heavy. I envy women who can wear bright red clothes and accessories. I don't have a single red item among my things! Great combo and perfect for theme day. Just love the way you've framed this shot. Bravo. It's super and even red in the reflection. Wonderful shot - red handbag, red coat and red reflection. Well done. Very cool "sneak" shot detail of this transit rider. One wouldn't miss seeing this lady in red :-). I had never thought to have to write that one day, but what a fabulous red!! That's red! This is well done. 55 years ago I took a picture of Patty wearing a red dress. It was April 1, 1955 when I gave her an engagement ring. Today, April 1, 2010 is 55 years. I posted her in the red dress for my entry in red on my Brookville Daily Photo blog. 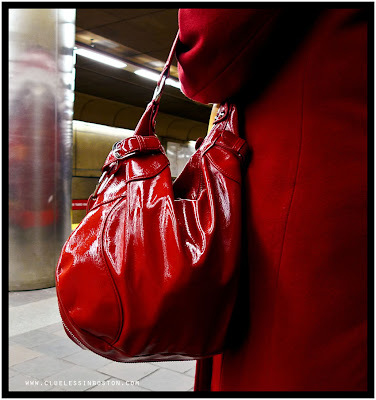 I like your post, with the red coat and purse. Well, every woman needs a RED handbag! Perfect for RED theme day! That looks to be a pretty full bag you've bagged. I sure hope she was wearing red shoes, too. There is the shoulder bag..
and then the Hip bag!! But what's the red reflection on the pilar on the left I wonder? What a perfect Theme Day picture! You even caught red in the reflection. I love that red coat and purse! Clueless, I usually visit you on monochrome days. However, this is monochrome of another sorts! LOL. Great view of a BOLD woman! Nice composition and a good choice of photo for April`s Theme Day. Now... were you near her or did you zoom in? Très, très chic ! Very well-done! Red leather has a comfortable glow about it, and this looks to be of very high quality. Good choice today! Red..as seen on the red line. Excellent!! Here is a lady that lights up whatever room she is in. Perfect for theme day. Wow! A red handbag is almost as good as red cowboy boots. Guess that's next!! Very nice catch. The square format is perfect.